Sidharth, Fawad and Alia's "Kapoor and Sons" has got good opening and collected Rs 6.85 crore nett at the Indian box office on the first day. Karan Johar's "Kapoor and Sons" has opened to decent response and collected a good amount at the Indian box office on the first day. The film has become the fourth biggest opener of 2016, beating "Mastizaade" and "Jai Gangaajal." "Kapoor and Sons" is one of the highly-anticipated Bollywood movies of 2016. Its promos have garnered a lot of attention for the film. The makers have shelled out a hefty sum on its publicity and its stars have promoted the film on several TV channels and also visited some cities for the same. 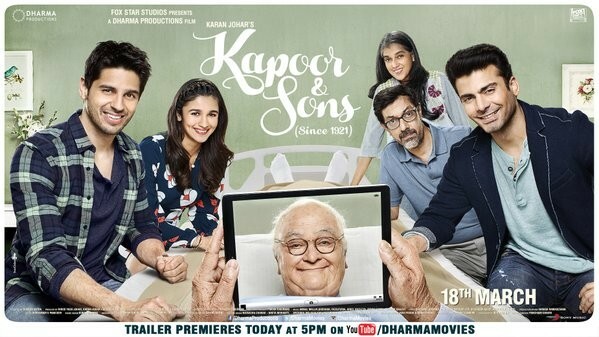 The distributors released "Kapoor and Sons" with 900 prints in 1500 screens across the domestic market and the movie had an average amount of advance booking. Trade experts had predicted that the film would get good opening in the domestic market and become one of the top 10 biggest openers of the year. The Sidharth Malhotra, Fawad Khan and Alia Bhatt starrer opened to an average response with its occupancy reaching 35 percent in theatres across the country. The movie impressed the viewers and critics in the first show Friday and the word of mouth took its business upwards in the later shows. The film witnessed higher amount of footfalls in multiplexes in metros, when compared to single screens. "Kapoor and Sons" has collected Rs 6.85 crore at the Indian box office on the first day. Taran Adarsh tweeted, "#KapoorAndSons picked up at metros/urban centres post-noon. Fri â‚¹ 6.85 cr. India biz." The movie has landed in the fourth place in the the list of top 10 biggest Bollywood openers of 2016. The word of mouth for "Kapoor and Sons" is very strong with many viewers and critics describing it as the best family entertainer of the year. The word of mouth is expected to help the film show big leap on Saturday. But its business will be badly affected by the WT20 cricket match between India and Pakistan, which will start at 7 p.m. Here is the list of top 10 biggest Bollywood openers of 2016. The stats are collected from various sources and they may vary from the actual figures released by the producers.